Move over Donald Sterling and Stephen Ross, there is an even worse owner of a pro sports franchise out there. And he just happens to be one of the greatest pro basketball players of all time. Let’s state the obvious here: Michael Jordan the executive is light years away from Michael Jordan the player. Oh, and there’s more. Jordan is the same dude who picked Kwame Brown as the overall top pick in 2001 and Adam Morrison with the second pick of the 2006 draft. Just horrible! How in the hell does a guy who, as a player, did everything he could to be the best can be so damn “turrible” as an executive? Does Jordan not have any pride? Now he’s leading the Bobcats’ tanking charge while losing their 21st straight game – 21 straight! – earlier tonight against the not as woeful, but bad, Washington Wizards. Hell given the margin of the loss (101-73), it’s obvious the Bobcats have long quit on this season. 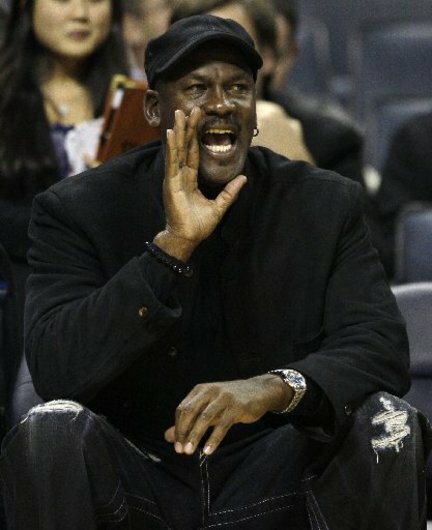 Here’s hoping that Michael Jordan loses out on the Anthony Davis sweepstakes. Hell, even if Jordan does get the top pick in the lottery, he’ll find a way to screw it up. Let’s hear your thoughts on Ron Artest, aka “Meta World Peace.” Please. Isiah Thomas – acted like a spoiled brat when he froze MJ out at ’85 All Star Game. Also led the infamous walk off the court when Bulls finally advanced past the Pistons in ’91. Jordan paid him back by stating that he wouldn’t play on the Dream Team if Isiah was there. Very immature of them both. Now they’ve become laughingstocks in their post hoop careers. Karma?